Puerto Rico general obligation bonds fell to 36 cents on the dollar after Trump told Fox News on Tuesday night that Puerto Rico’s debt will have to be wiped out. Looking back, bonds prices started the collapse in 2014, well before Trump comments and well before hurricanes. Puerto Rico borrowed billions of dollars, more than any state in the US except California and New York for energy infrastructure, but the money did not shore up its aging infrastructure. CNBC reports Puerto Rico bonds plunge to just 36 cents on the dollar after Trump pledge to wipe out debt. On Tuesday night, he told Fox News that Puerto Rico’s debt will have to be wiped out. “They owe a lot of money to your friends on Wall Street and we’re going to have to wipe that out. You’re going to say goodbye to that, I don’t know if it’s Goldman Sachs, but whoever it is you can wave goodbye to that,” Trump said. After years of overspending and racking up massive amounts of debt, the average age of Puerto Rico’s petroleum-powered energy plants is 44 years vs an 18 year-average in the US. 44% of Puerto Rico’s electricity is from petroleum vs 0.6% in the US. On top of $70 billion in debt, Puerto Rico has $123 billion in unfunded liabilities. Not sure…the hurricane blew away the receipts? Spanish bond yield spiked today. All problems are easy once you know the answer. I am confused. Who loaned the $$ to PR in the first place? Who holds the paper now? Somebody real dumb, right? Clients of Goldman Sachs? Like the guys who gave all the money to Greece? Small investor clients of Merril Lynch who have no idea that they bought PR bonds??? 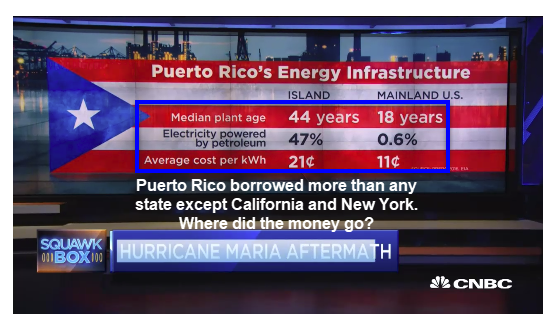 “Where did the money go?” Stolen by crooked officials, like everything else in PR…The electric utility did not trim trees, even, which led to much hurricane damage….No doubt the “right” people took the money…. Hearing the truth every now & then is very good for people. Puerto Rico *needs* bankruptcy. I voted for the Trumpster but all his gratuitous comments are wildly inappropriate and will probably do him in, probably have already, he’s always shooting from the lip. Uncle Sam has to be careful here … if there is a “deal” … every other State (hello Illinois) that will go bust further down the road will want same. 36 cents on the dollar? Still overvalued. 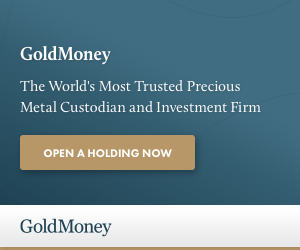 You can rest assured that “investors” with close connections to Congress leeches, are snapping the bonds up en masse right now, while prepping their favorite Congress puppets for another confrontation with Trump. In fact, whomever in Congress speaks first and loudest, should reflexively be flagged as those most solidly in the pockets of the racketeers that are robbing the country. This comment is the closest to the much ballyhoo’d swamp draining, that Trump has gotten around to engage in so far. People have gotten used to the notion that buy the dip is always a good strategy. Soon they will be remembering that old warning about catching the falling knife. PR will have to walk away from its debt because its production has been smashed. They no longer have even the fantasy means to pay. They in fact will need more money than before to clean up the mess. Some time ago, Walker’s Cay in the Bahamas was a thriving high end destination. The owners built crappy structures there in order to keep costs down and maximize profits. Then a hurricane came in and wiped them out. The government of the Bahamas simply does not have the money to bail them out and it does not have the national credit card that the US does. So the island was literally abandoned for over a decade now. That’s the way conservatives play it. The only other alternative would have been to rob the rank and file in order to please the money elite who used to use Walker’s as a party destination. If private capital cannot afford to build or repair then government should stay away as well. How is PR going to make interest payments on their bonds? I think it’s safe to assume tax collections are way down since Maria. It’s time to grant PR independence. Ya i was wondering the same “where did the money go ? ” particularly when the mayor of san juan started complaining about response issues from the US. Much of the problems PR has now could have been avoided by application of fiscal responsibility and less corruption. From what i was reading PR ‘s unfunded pension system is the most in hock. R.Scott called another state of emergency. Looks like the troubled masses will be heading to the ORLANDO area . Orlando is to Puerto Ricans what Miami is to Cubans. I have a friend whose wife is Puerto Rican. Her parents just flew in last night. He doesn’t know how long they will be staying with them. PR is like the irresponsible and defiant adult son who shows up on mom and dad’s doorstep looking for a handout whenever the bottom falls out. Evacuate the island and designate it a naval gunnery range? Might make you wonder why a $200M stadium in the 1990s now cost $1B to build. Hint you roll the old stadium debt (the principle was never paid off) into the construction of the new stadium. It matters not if they are bonds from Puerto Rico or California or Ohio or any other state. They are all unsecured and can be worth pennies on the dollar. Welcome to the world of ‘Sovereign Defaults’ and the era of Deflation brought about by people hoarding whatever they see as ‘Cash’. Ask the DNC. They run the place. Yeah, P.R.’s bankrupt system is Trump’s fault. Sure. He is right, the debt should be wiped out. So can the Fed lend PR the money to buy back their bonds on the open market? At that rate 70B becomes 30B. Then they issue new bonds with a new credit rating to pay back the Fed. Nah. The bondholders to eat the loss – then within 10 years PR will find itself in the very same financial hole that it’s in today. Governments are never allowed to fail. That’s reason they never improve. And those who run the governments never get flushed out. 5, 6 or 7 terms of being an incompetent hack is not the exception – it’s the rule!